Rajinikanth movie poster for sale of the Hindi film, Johnny Ustad (1987). This is an actual surviving classic Bollywood movie poster of the 1987 Hindi movie that featured the “highest paid actor in Asia,” superstar Rajinikanth in a double role. The film also starred Sridevi and Deepa. This Rajinikanth movie poster was designed and printed for publicity of the film during its original first release (somewhere in the late 1980s). The printed signature of noted Bollywood poster painter C Bakshi is seen on the bottom right hand corner of this old Rajinikanth movie poster for sale. Superstar Rajinikanth is seen in a brilliant hand painted rendition smoking a pipe. Actresses Sridevi is seen alongside. A blue sky background is seen in this old Rajinikanth movie poster for sale. This Rajinikanth movie poster was designed and printed for publicity of the film a few years after its original first release (somewhere in the late 1980s). Superstar Rajinikanth is seen in a brilliant hand painted rendition prominently in the poster in a karate pose. Actresses Sridevi and Deepa are seen alongside. A fiery background is seen in this old Rajinikanth movie poster for sale. 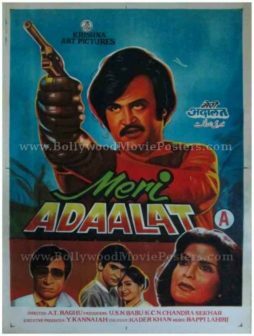 Rajinikanth poster for sale of the classic Bollywood movie Meri Adalat (1984). 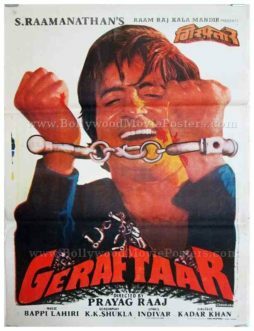 This is an actual surviving classic Bollywood movie poster of the 1984 Hindi movie that featured the “highest paid actor in Asia,” superstar Rajinikanth in the lead role. Printed and circulated during the first release of the film (somewhere in the early 1980s), this Rajinikanth poster was originally designed for publicity of the film but never ended up being used. 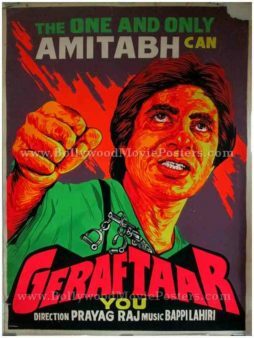 Superstar Rajinikanth is seen holding a pistol in a brilliant hand painted avatar in this classic Bollywood movie poster. Quirky caricature like portraits of the supporting actors are seen at the bottom, including a large portrait of lead actress Zeenat Aman. This Rajinikanth poster is set against a blue background, giving it a very catchy appearance. 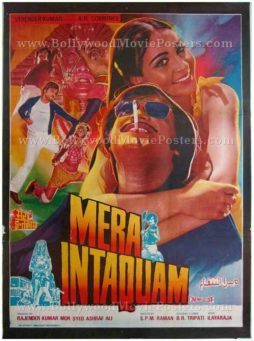 Rare vintage Rajinikanth poster of the 1985 Bollywood film, Mera Inteqam for sale online. This is an actual surviving old Bollywood poster of the 1985 classic, which starred superstar and cultural icon Rajinikanth in the lead role opposite actress Rati Agnihotri. Printed and circulated somewhere in the late 1980s, this old Rajinikanth poster for sale was originally designed for publicity of the film in Kolkata but never ended up being used. Rajinikanth is the highest paid actor in Asia after Jackie Chan and the undisputed reigning superstar of the South, making this poster highly collectible. This hand painted Rajinikanth movie poster features a stunning hand drawn portrait of Rajinikanth holding a machete. Rajinikanth is seen in a romantic pose with Rati Agnihotri at the bottom of this hand drawn Rajinikanth film poster. 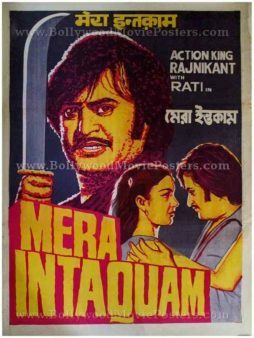 Rare original old Rajinikanth poster of the 1985 Bollywood film, Mera Inteqam for sale. 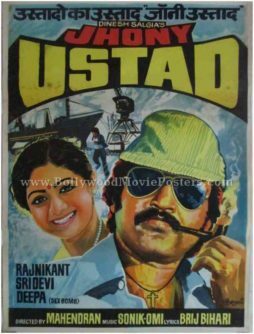 This is an actual surviving vintage Bollywood poster of the 1985 classic, which starred superstar and cultural icon Rajinikanth in the lead role along with Rati Agnihotri. Printed and circulated somewhere in the 1980s, this old Rajinikanth poster for sale was originally designed for publicity of the film but never ended up being used. This artistic over painted Rajinikanth poster features stunning portraits of lead actors Rajinikanth and Rati Agnihotri. Rajinikanth is seen smoking a cigarette in his trademark style in this original Rajinikanth movie poster. Classic Bollywood movie poster of the Hindi film Farishtay (1991) for sale. This is an actual surviving poster of the 1991 film that featured south India’s biggest superstar of all time, Rajinikanth (the second highest paid actor in Asia after Jackie Chan), who plays the role of a police officer. The film also stars Sridevi, Dharmendra & Vinod Khanna. Printed and circulated somewhere during the first release of the film, this classic movie poster was originally designed for publicity of the film but never ended up being used. This poster was originally designed by cutting out images of actors from separate still photographs (shot on set location) and pasting them on a board. The typography is hand drawn / hand painted, which makes this poster an interesting mix of two very different design techniques. The poster features a large cut out photograph of Sridevi at the center – capitalizing on her stardom at the time. A still photo of Rajinikanth in a police uniform is seen on the left whereas Dharmendra and Vinod Khanna (who play brothers in the film) are seen wearing rounds of ammunition strapped to their chests and holding machine guns on the top. The typography used in this poster is entirely in English, except for a translation of the title in Devanagari Hindi on the top left. The film’s title is seen in tricolor lending a patriotic vibe to the film. 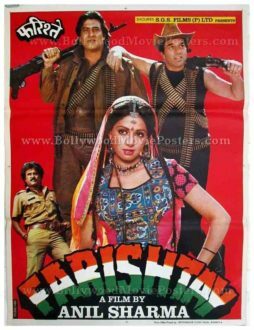 Farishtay is a 1991 film about two brothers who are petty criminals, played by Dharmendra and Vinod Khanna, who set out to find the killer of their close friend’s police officer husband (played by Rajinikanth).